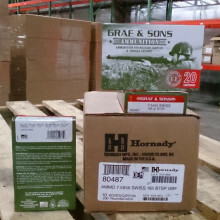 BULK 7.5x55 SWISS AMMO WITH FREE SHIPPING AT AMMOMAN! 7.5x55 ammo, perhaps better known as 7.5 Swiss ammo, is one of the first 7.5mm rounds ever to use a copper jacket. In service by the Swiss Army since 1889, the caliber is used by today's sport shooters and is still relied upon by the Swiss Army Reserve. You'll find 7.5x55 rounds with full metal jacket, soft-tip, and hollow-points available to American shooters on the civilian market.